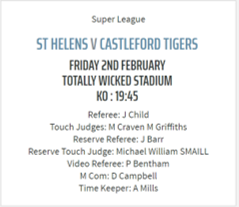 St Helens Trio have been appointed to the opening round of Super League this weekend. Denton Arnold, who last week Touch Judged his first Super League level game when Warrington Wolves played Salford Red Devils in a pre-season friendly, has been appointed as In-Goal to Salford Red Devils v Wigan Warriors on Friday night. Jamie Barr has been appointed on Friday night, he will be Reserve Referee for St Helens v Castleford Tigers, shown on Sky Sports. 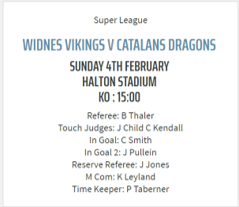 Craig Smith is appointed as In-Goal on Sunday afternoon when Widnes Vikings play Catalans Dragons. Craig recently refereed his first Super League level fixture when Widnes Vikings hosted Whitehaven in a pre-season friendly. Good luck to all Denton, Jamie & Craig as well as all of our members out on games this weekend. For the full list of RFL Appointments click HERE.